We were out at 7:15 without difficulty. The first leg took us out beside Fort Sumpter where the Civil War began. It was not open yet so none of its flags were flying. The rest of the day was spent in the waterway passing through giant marshes. It was like being on the prairies since all you could see to the horizon was marsh. As we neared Georgetown the waterway widens out from an ocean inlet and with a south wind become a little choppy with 2 foot waves. We were welcomed by a boarding from the Coast Guard. Katy Leigh passed inspection without a problem. Next a 40 foot Bluewater called 'Looking Good' didn't look so good when it ran hard aground mistaking the channel buoys for the ICW buoys. TowboatUS finally got her off 4 hours later when the tide started to rise. She had to be towed in so there must be damage. We are beside a 125 foot sailboat 'Snow Goose' from New Jersey. The crew is hard at work fixing blisters in the fairing that covers the aluminum hull. Georgetown is another old town settled in the 1700's with a number of houses dating back to that time. 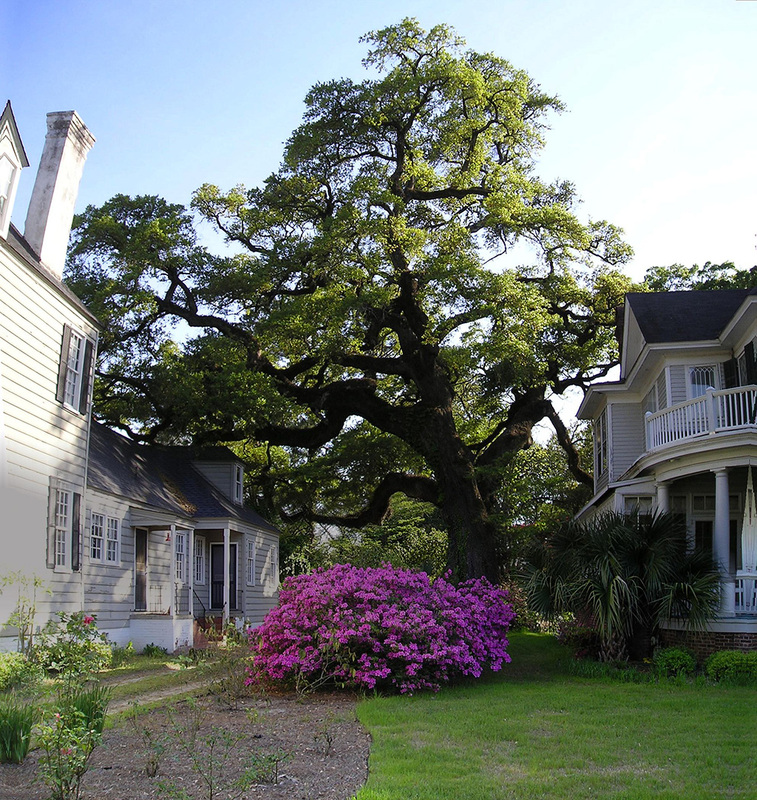 The live oak pictured between the two houses is over 500 years old and measured 23 ft in circumference, 120 feet tall, with a crown spread of 125 according to the sign dating to 1940.